Today we'll take a look at glitter! 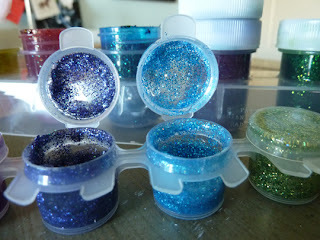 A mini glitter tutorial on the various types of glitter available at the craft stores. Working with glitter is so exciting for kids (and adults) but can create quite a mess in a hurry. I had an assortment of thin wood Christmas ornaments for the kids to choose from. The supplies included acrylic paint, glitter paint, glitter glue pens, "real," "pour," or "regular" glitter, brushes, water cups and paper towels. 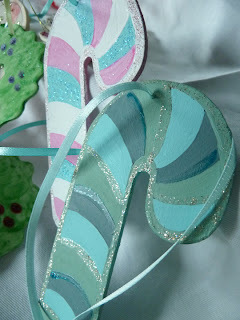 Glitter in all forms takes enormous amounts of time to dry, so plan accordingly, whether you're working on something yourself or a craft gathering. 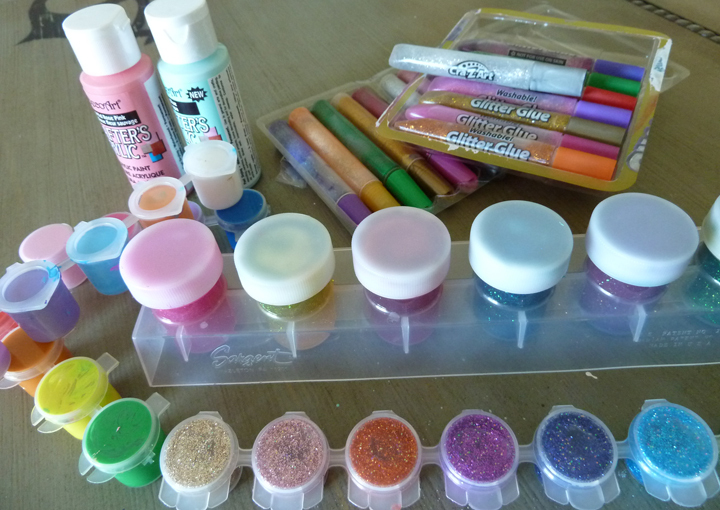 Glitter paint. This medium is fairly new to me. Thinner than the glitter pens and easier, naturally, to get more surface area coverage. But it's a very translucent paint that primarily delivers glitter to the object. So for some we chose to paint the wood first with acrylic craft paint. 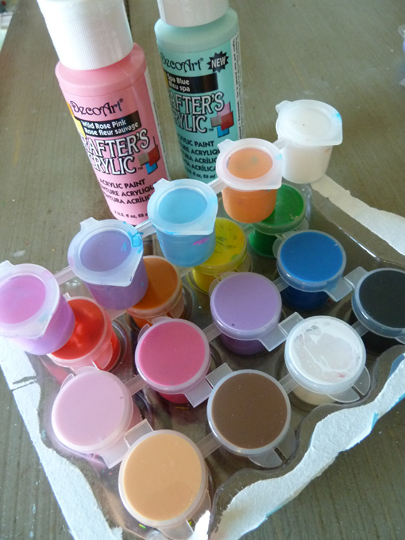 This gives the desired opaque look and dries quickly. 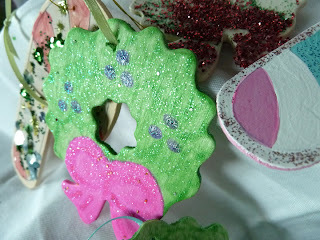 The two green wreaths were done entirely with glitter paints. I applied the paint quite thick to achieve more color coverage, yet you still see the natural wood right through. I also swirled the green paint and brushed the pink and turquoise paint into the pattern of bows - the thicker areas show up darker. As you can see below the glitter paint dries flat. Glitter glue comes in many forms: pens, squeeze bottles, tubes, sticks, etc. Pens are easy to hold and direct. Some new brands claim to retain a bit of roundedness when dry ... but take thicker takes even longer to dry. They are prone to globbing, but often the globby messes can be 'pushed' back into place or partially removed. 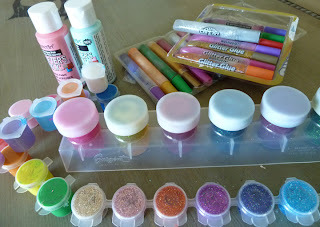 The glitter glue pens along with sprinkle glitter I'll continue in part 2 next time! 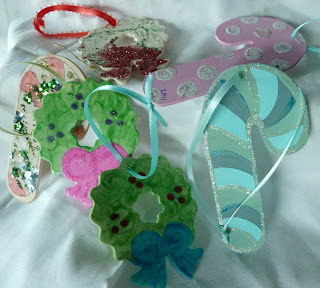 I think the great ladies in crafting heaven invented glitter glue and glitter paint just for moms!! I don't recommend regular/sprinkle glitter for kids under 6. Maybe even 8. Depends on their dexterity. 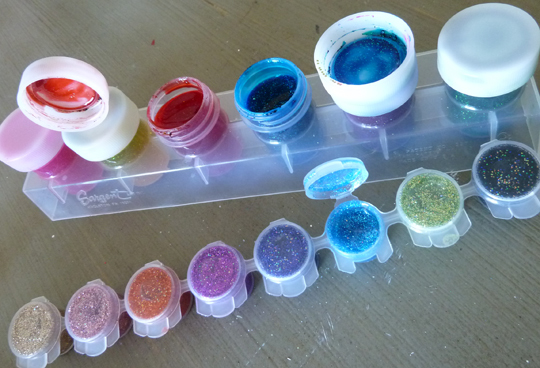 Glitter paint is the easiest form of glitter for little ones to control. They love the pens, but be ready for drips and blobs. But, these are washable!! Tables, chairs, clothes and floors can be easily washed. If you've braved sprinkle glitter with wee ones, when you're done I recommend stepping outside for some active play! :-) Let them loose – dance, jump, run – to get all the glitter out. Clean the floor with a wet paper towel. Jeanne, do you have any tips for cleaning up glitter? My kids love it but it usually ends up on the floor, in their hair, etc. We're all very sparkly for a while after glitter projects! 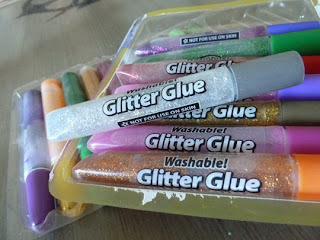 Actually I recommend the glitter glues and paints for our wee ones! I am SURE it was invented by moms frustrated by just what you are describing! Ha! It creates much less mess. Start with the paints or glues in brush form, then graduate to glue pens, THEN the real deal. But, if you must sprinkle .... contain your area with newspapers and use wet paper towels for clean up of spills. Have the kids step outside if possible to shake out all the sparkles in their hair and clothes. I've updated my post in response to your great question! !